Cincinnati Bengals linebacker Vontaze Burfict (55) warms up prior to the game against the Baltimore Ravens at M&T Bank Stadium. CINCINNATI — The Bengals will likely be playing short in the tight end department when they host Baltimore for Sunday’s regular season finale. Jermaine Gresham (hamstring) is listed as questionable and rookie Tyler Eifert (neck) is doubtful after neither practiced on Friday. Eifert was injured in last week’s win against Minnesota. Veteran Alex Smith (concussion) returned to practice Friday and is probable to play. The Bengals can also use Orson Charles at tight end. Cornerback Terence Newman (knee) and defensive tackle Devon Still (back) have been ruled out of the game but the Bengals got positive health news when it comes to linebacker Vontaze Burfict. 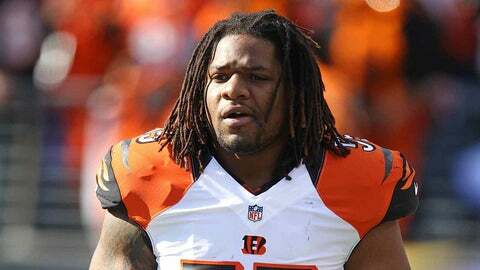 Burfict (concussion) returned to practice on Friday and is listed as questionable to play. He was cleared after leaving the Minnesota game with a head injury. Burfict leads the NFL with 157 tackles, five more than Jacksonville’s Paul Posluszny. Besides Alex Smith, five other Bengals are listed as probable: cornerback Dre Kirkpatrick (ankle), linebacker Vinny Rey (ankle), right tackle Andre Smith (ankle), linebacker James Harrison (concussion) and defensive end Carlos Dunlap (illness). The Bengals have wrapped up the AFC North title with a 10-5 record but have plenty to play for this weekend. They will host their first playoff game regardless of a win or loss on Sunday but a win keeps them alive to possibly earn the AFC’s No. 2 seed and a first-round bye, while a loss could knock them to the fourth seed. A Bengals win combined with a New England (11-4) loss at home against Buffalo would leave both teams tied at 11-5. The Bengals would get the No. 2 seed based on its 13-6 win against the Patriots on Oct. 6. Indianapolis is also alive for the second seed. The Colts (10-5) need to beat Jacksonville and have both the Bengals and Patriots lose to earn the bye. If the Bengals, Colts and Patriots all finish at 11-5, the Bengals win the tie-breaker and No. 2 seed because they have wins against Indianapolis and New England. Head coach Marvin Lewis said this week that he plans on playing his regulars and not giving any extra rest to players. That said, there’s also no reason to push any injured players and risk their availability for the postseason. "We don’t know what it’ll mean until it’s over and later that evening but we’re going to do everything we can to win the football game with our guys and go at it that way," said Lewis. This is the third straight season the Bengals have hosted Baltimore in the regular season finale; the Ravens won 24-16 in 2011 while the Bengals won last year 23-17. Two years ago the Bengals got into the playoffs despite the loss when the New York Jets lost at Miami. The Bengals were locked into the No. 6 seed last year no matter the outcome of the game.